I have 10 puppies left in a litter. They are beautiful pups. The pictures don’t do them justice. Parents are on site. Parents are hip tested and certified with OFA. Puppies are UTD on puppy shots including coverage for leptospirosis. They have been dewormed and health checked by our vet. They are AKC reg. We are near the Ft worth area but can meet if your wanting a pup and live far away or I can refer you to a transporter who drives puppies to their new homes. Please contact me if you have any questions. Orange is a beautiful stout liver nose boy with a red wheaten coat. He is a sweet boy who loves his independence but loves to play and snuggle with his people. Sire is Belyeu’s Bodacious Boudreaux he he is a beautiful liver nose male. Very stout and weighs in around 89-95lbs. 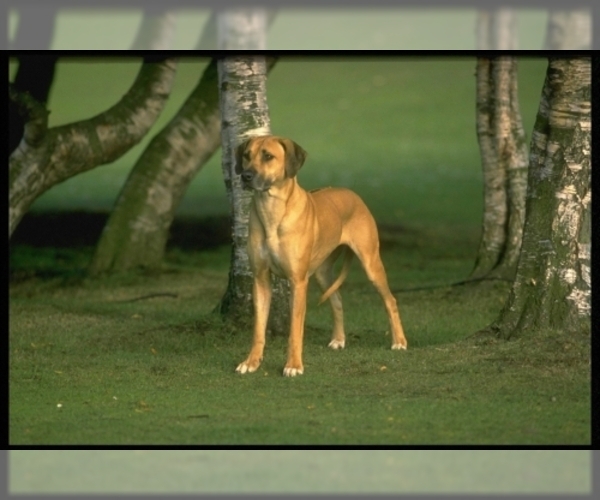 Overview: The Rhodesian Ridgeback is great as a hunting dog, a watch dog, or a family pet. They love children and are always eager to please their owner. Colors: Light wheaten to red wheaten; nose can be black, brown or liver. Coat: Short and dense, sleek and glossy in appearance. The hallmark of the breed is the ridge on the back which is formed by the hair growing in the oppositedirection to the rest of th coat, it should be tapering and symmetrical. Character: Rhodesian Ridgebacks are intelligent and independent. Known for their bravery, they are cautious around strangers and make great watch dogs. Temperament: This breed requires early socialization with cats and other dogs to prevent later problems. They do well with children, as long as the kids are not too rough. These dogs are reserved around strangers. Care: The Rhodesian Ridgeback requires occasional brushing. Use a rubber brush to remove dead hairs during times of shedding. Training: This breed can be somewhat stubborn, so requires a firm and consistent training approach. Activity: The Rhodesian Ridgeback has a lot of stamina, so he needs a good deal of exercise. Regular long walks are required along with some other outdoor activities. Health Issue: This breed is hardy and able to withstand dramatic changes in temperature. They may be susceptible to heart disease, dermoid sinus, and cysts. 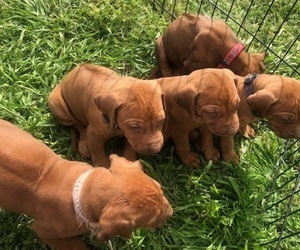 4 Males and 3 Females. All puppies are well socialized and ready for their new owner! Posted Breed: Rhodesian Ridgeback (medium coat). 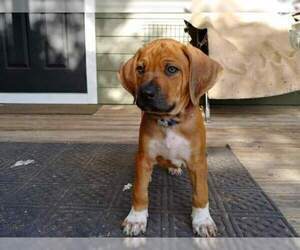 Posted Breed: Rhodesian Ridgeback / Rottweiler. Adoption Fee: 300.00. Posted Breed: Rhodesian Ridgeback (short coat).